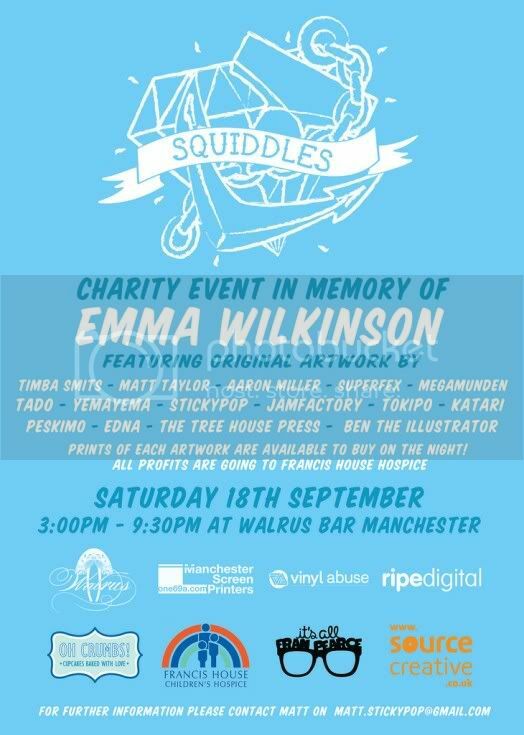 This Saturday (18th September 2010), Illustrator Matt Daniels (Stickypop) holds a one-off exhibition in memory of his girlfriend Emma Wilkinson, who sadly passed away at just 19 after a rare reaction to the virus Epstein- Bar. The exhibition will contain works of illustration artists such as Gav Strange, TADO, Superfex, Matt Taylor, Aaron Miller, Peskimo and Katari amongst others and will be in aid of the 'Francis House Hospice' . Prints by all 15 artists will be available to view on the day, 20 limited edition t-shirts which have been designed by Matt as well as 30 A5 hand printed Gocco prints by TADO, alongside a raffle of other donated items which have been given by illustrators and artists to support this inspiring exhibition. It is a great opportunity to see some great artwork and is all for a good cause. The exhibition will take place at Walrus Bar, High St., Manchester from 3pm until 9.30pm.